Home » Rose Water & Orange Blossoms Blog – Fresh and Classic Lebanese Recipes » Ingredients » Morel Mushrooms (and lilacs). The problem could well have been the lilacs. 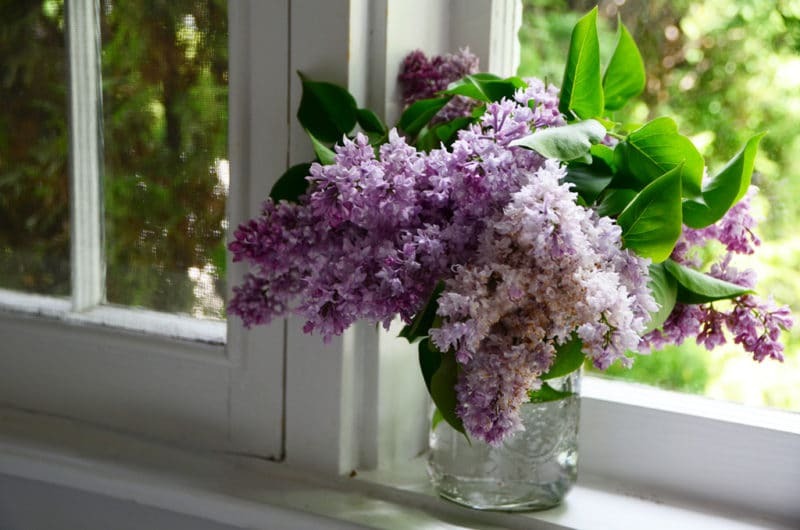 Anytime a bundle of fragrant, just-unfurled lilacs enter the room, the rest of us may as well be invisible. And if that’s true for you and me, it’s doubly true for a mushroom. Never mind that these sweet morsels, the lilacs, were stolen from the neighbor’s yard. That neighbor is never here, you know what I’m saying? They come for one week in July, and that is all. I know that they would not want those lilacs to go unnoticed, to blossom and release their gorgeousness only to the delight of the bumble bees. So to put their out-of-town minds at ease, we clipped a few. Those were placed in mason jars and delivered to the cemetery by Mama and Peg for the neighbor to the west, Aunt Latifi, and the neighbor on the other side, Eris Smith. 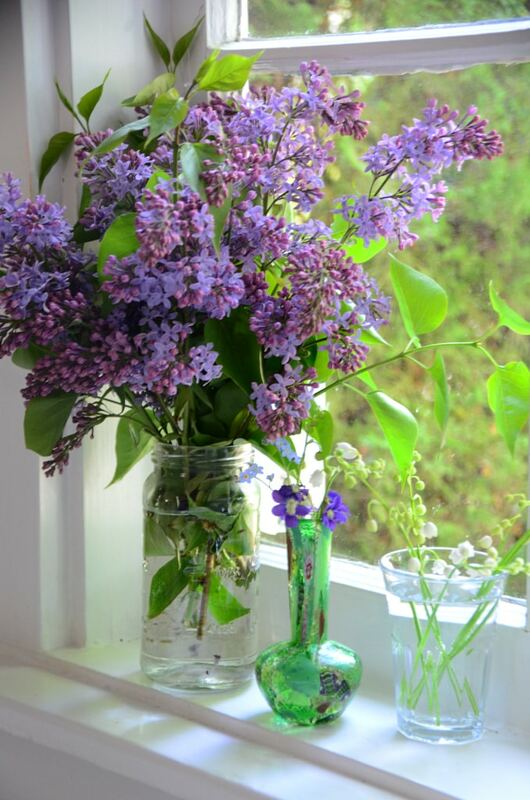 By then I was so intoxicated with lilac that I had to run over and snip just a few more for my mom’s kitchen window. That ledge is bedecked right now with the jewels of the yards that my mother finds here and there and can’t help but pinch off and place in a tiny vase or glass. I promise, though, that this is a post about morel mushrooms. You may start to wonder how a girl who’s been gone writing could take so long getting to the point. And later this week you may wonder why I don’t have much in the way of photos of the dish I ended up making with the morels. I won’t defend myself other than to blame the lilacs for distracting me and my camera. 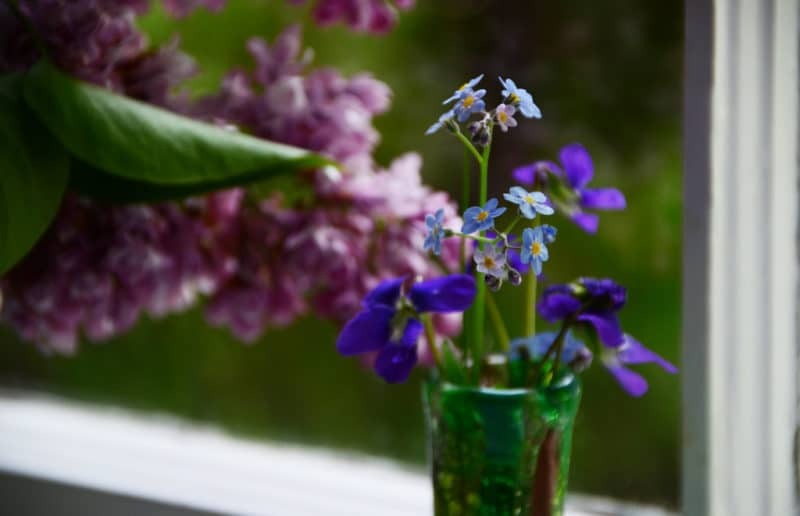 And the fact that the morels, jewels of the woods themselves, while fascinating and for whom I traveled a good hour to procure, can’t hold a candle to the lilac splendor when the two are hanging out side by side in the kitchen. I say I traveled a good hour, and that’s true, but I don’t want to mislead you to think I went mushroom hunting. Morels beckon serious lookers and adventurers and woodsy foodie-crazed folk to pluck them from their wild, secret places. For that I’m all about the middle man. Or middle woman, as the case may be. 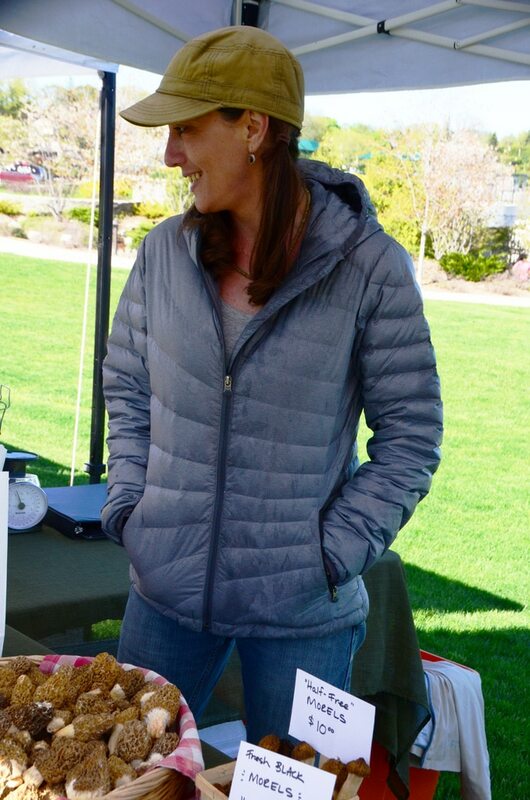 A serious mushroom hunting genius named Ashleigh and her husband Ken make the morels possible for those of us up here who are never, not ever, going to go pulling up the foliage in a dampy woods to find the little guys hiding out there. But Ashleigh, she takes her pretty self out into the woods from spring until the snow flies, on the hunt for gems for her Michigan Mushroom Market. My good hour of travel was to Charlevoix, to the farm market that took place at the height of Memorial Day traffic last Thursday evening. Which was very good for farm market business, and not as good for someone getting in her car when she really didn’t have to at that hour on that day. The thing is that when you’re ride is taken up with scenes of the bay with its own unfurling jewels, traffic just becomes a way to keep staring out the window and oohing over it with Mom. Do not eat morels raw. They must be cooked thoroughly. You don’t want to find out why. Morels are prized for lots of reasons, not the least of which is their short season. In Michigan, depending on how late winter stuck around, they’re up in May until early June. There are two most common varieties: black morels, and yellow or white morels. This is not unlike the difference between the black and white truffles—both are wonderful/special/delicious but one is a cut above the other. In the case of morels, the blacks are the favorites, with more of that deep dark woodsy umami flavor. There’s another mushroom called a “cap” that looks a lot like a morel. But it ain’t. It’s a cheap knock-off. 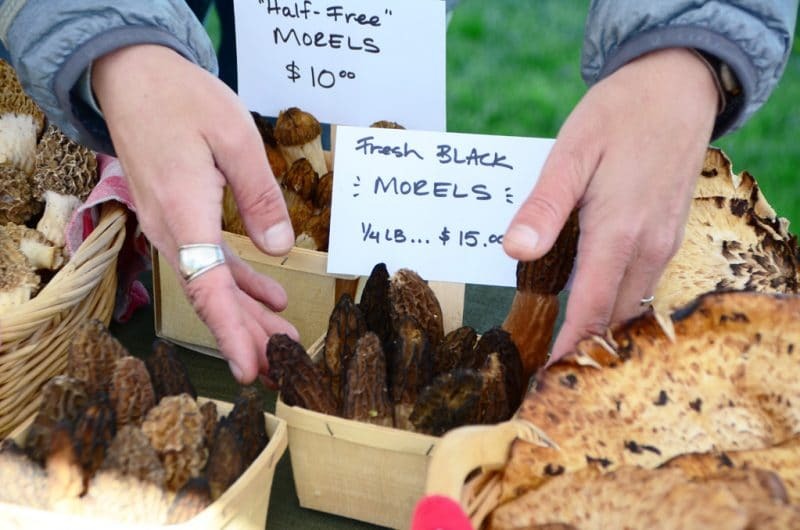 Like any knock-off, you can tell of course by price (morels are, get ready, $60/pound. Ashleigh gently announces her price at $15 for 1/4 pound). You can also spot a knock off if you look closely and pay attention to detail. The cap stem is milky and dense, nothing like the tender, hollow morel stem. Plus, the cap is flimsily attached just at the top of the stem, whereas the morel is attached a good half way down the stem; sturdy construction. Caps are edible and many do eat them, but Ashleigh said enough about liver toxicity and caps to keep me from eating them anytime soon. If you’re going morel hunting, be sure you know what you’re looking for. I can’t help but think, whenever I see or eat morels, of Into the Wild and the untimely demise of the guy who’d mistakenly eaten poisonous leaves out there. Wild can be…wild. I used to think morels were a Michigan thing. They’re not. The whole Great Lakes region, Northern California (my culinary school teacher was a mushroom fanatic) and God knows what other uppity states outside of the deep south and the desert have morel boasting rights. Fine. We can share. Stay with me…lots of photos or no, the dish we’re making this week with our morels is outta sight in more ways than one. 12 Responses to "Morel Mushrooms (and lilacs)." My kids pick them almost every day. They cook them up and they are GONE! I was told (By a Dr.) That young children should not eat many because of their liver. Wow, they are morel pros! Lucky them! I’ve looked and looked but have yet to find any. Buying them is a lot easier. 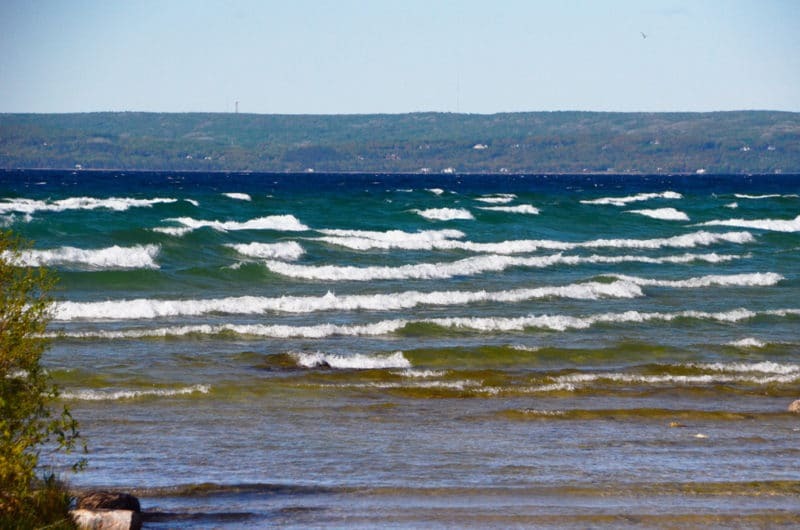 Oh, my, Maureen, you’ve brought back memories of all of us (little Stacy and Kristan) sprayed head to toe with mosquito repellent, bags in hand, combing the woods behind our Torch Lake cottage. Most of the time, thankfully, we enjoyed an evening feast of morels and fresh fish. Many thanks. PS Loved the lilac photos, too! 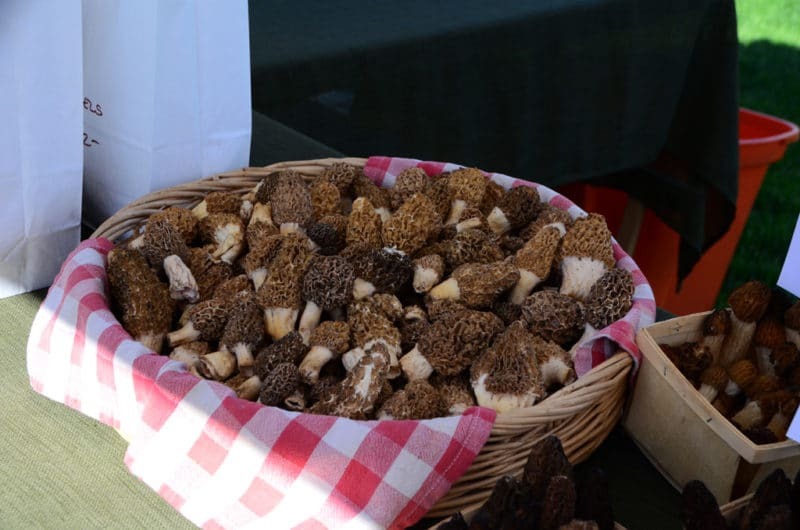 How special, and that morel and fresh fish meal with the family sounds heavenly…. Here in West Central Missouri people keep their location as a deep family secret. They only seem to last about a week or so and make up the entire conversation of the community. It’s like a bunch of fishermen bragging about their “catch”. Out in West Nebraska they are very common along the Republican River. We used to pick them by the grocery sack about the same time we were picking sack after sack of wild asparagus. Since I don’t have morels on my farm and friends farms are off limits during that season, I have learned to pick “puff balls”. The season is longer and comes during the summer. Puff balls are round and can range in size from a marble to a soft ball. They are named because when they are mature and one kicks them a large puff of spores, like smoke is emitted. For eating they are picked as soon as they come up and before they create spores. The catch is they have to be eaten within a few hours of picking. Leave them overnight and they mature. But picked at the correct time and eaten fresh they are very mild and great eating. Great info Roger, thank you!